Yeah I like the bar in that last pic as well. Here is one of the X-Rox fitted to a Dmax. By the looks it would get air flow through the laser cutting and the holes in the bash plate but hard to tell for sure. That white one is so high any kangaroos, pigs dogs or cattle you hit with that will just go straight into the suspension, stuff the steering rods, bend the shocks and all the hit will be wheel oriented and probably largely miss the bar. Are these just to look cool as you pass another vehicle or when parked in the town or are they for actual use? The way I see it, it is going to cause damage rather than prevent it. Bugger what it looks like it is for protection not "pictures and lookin' good". I still like the design of the bullbar in that pic posted by DIRT-KING. That bar on a normal raised vehicle of 50mm would give excellent diagonal approach angles while still offering good frontal protection. Most of the time if you hit something it goes under the car anyway so while the main force of the hit is taken by the bullbar there is still the chance of collateral damage under the car as well. I certainly would not put something on my car that didn't think looked good in my opinion but there also has to be consideration taken into it's ability to do the job intended. For example neither of those would find their way onto my car. Just received the latest ARB magazine they have a write up on the new Dmax and what they are offering; including a blurb about the ARB bullbar. Hopefully it is not too far off into the future, I will be looking at the OME lift as well. Got a price on this bar yesterday and must say it was a bit more than I expected it to be. Just a tad over $2300 and that is black not painted. Will be crossing this one off my list for sure. Me either but now we both know better. Thats a nice looking bull bar for the new D-Max from Dobinsons. It looks a lot like the ARB bar for the older D-Max but with a split mid section for better breath ability. I've seen pictures of the new ARB bull bar and it doesn't look anything like the older one. Their new one looks flat and doesn't follow the the shape of the head lights with the up-sweep angled ends like the older ARB D-Max bar. I know that some really like the new shape bar but personally I think the new shape matches that of the Hilux or the Landcrusier with the flatter headlight shape but on the new D-Max it looks mismatched. Especially with the cut away bumper sections. I guess horses for courses. I am still trying to decide which way to go and have read that Bilstein Shocks are supposed to be the bees knees, they also have a 5yr warranty. 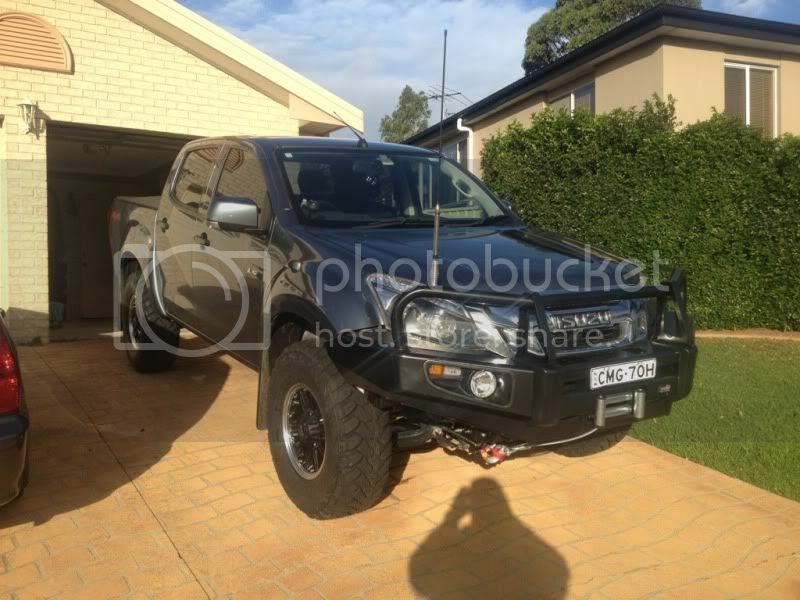 I have found a dealer very close to home that is a Dobinson dealer, maybe a Dobinson lift with Bilstein Shock all round. I also have a Dobinson's Bullbar on it's way. I did just slightly prefer the light setup in the MCC bar but for the price the Dobinson Bar will be fine. Just as a heads up for anyone interested Brown Davis now do underguards for the new Dmax. They are not listed on the website but I do believe they are available at about $580 for the pair (front engine & transmission guards). Has anyone upgraded the sound system in their car yet?